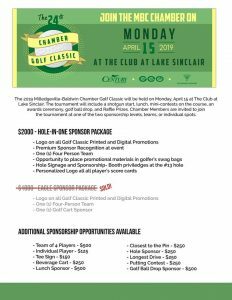 Join the Chamber of Commerce for the 24th Annual Chamber Golf Classic on Monday, April 15 at The Club at Lake Sinclair! The tournament will include a shotgun start, lunch, mini-contests on the course, an awards ceremony, golf ball drop, and Raffle Prizes. Chamber Members are invited to join the tournament at one of the two sponsorship levels, teams, or individual spots. To register for a team, complete the form here. This event is proudly sponsored by Century Bank & Trust, the GEO Group, and Zschimmer & Schwarz.